Avatar DVD Review By John C.
As a piece of thought-provoking entertainment, I loved Avatar. It’s visually stunning, with moments of absolute greatness. At 163 minutes it never drags and I thoroughly enjoyed myself. But for all that it is, it’s not without some flaws. The film falls short several times due to cheesy dialogue, and the fact that the nearly unobtainable mineral the humans are after is named “Unobtainium.” The new age elements are also sometimes a little weird, and the overall story just isn’t quite up to the level of the groundbreaking, breathtaking special effects. But all problems aside, this is a heck of a lot of fun and downright beautiful to watch – even on DVD or Blu-ray. Being able to watch it not amidst a confusing awards-season haze, not constantly comparing it to all the other great movies of ‘09, and without hearing controversy claims from left, right and centre, made me finally realize what made Avatar so great in the first place. The epic sense of flying, and the feeling that you are there. And that’s what movies are all about: Immersing you in a new world for a couple of hours, making you feel like you are somewhere else. It’s also the feeling that you get from watching a movie that’s made over 2.7 billion dollars – the feeling that you are one of the millions of people that have experienced it. I am still grappling with whether or not to give it the full 4-stars, as it is somewhere between excellent and outstanding, but imperfect in terms of script. I’m going to go with ***1/2 for now, although I will try to revisit the film when it is re-released in theatres this August, with 8-minutes of extra footage. Until then, ‘brothers, sisters, I see you.’ Maybe next time I will be saying that in Na’Vi. The DVD includes no bonus features, but is available to buy as a Blu-ray/DVD combo – which is the one to get. It looks spectacular on Blu-ray, almost up to the theatrical experience. It will hold up well to repeated viewings, so this is one you’ll want to have in you personal collection. Avatar DVD Review By Erin V.
I’m not going to bother getting into telling you that Avatar is about an ex-marine named Jake Sully who is sent out to a distant moon called Pandora, to run a remotely controled alien body called an ‘Avatar’, in order to learn the ways of the natives (called the Na’vi), in order to get them to move off of a rich deposit of ‘Unobtanium’, but starts to see things from their side, which leads to a battle between the natives and the imposing army. I’m sure you already know all of this, and if not, just follow the link at the top of this post to the official website for a synopsis that is not just one run-on sentence. Is Avatar the best movie ever made? I can assuredly answer you ‘No’. It’s good, but I will reserve my four stars maybe for the next installment, which is said to be in the works. Essentially for my money, Avatar is a well-made film – although not the strongest in terms of script. Visually, it has made its mark in the history of computer effects, as well as 3D, which I whole-heartedly agree with. Since this is a bare-bones DVD release, unless you really can’t live without the film for the next little while, I’d suggest waiting until a bigger disc set comes out with additional ‘special features’ DVDs. Until then, rent it to check it out on the small screen. I found seeing it again on the small screen to be an interesting experience. I don’t think there’s any doubt why this is the phenomenon that it is. When I first saw Avatar on the big screen, I was blown away by the incredible beauty of the film. The stunning visuals are not lost on Blu-ray, so if you are one of the few people who have not seen Avatar in theatres, now is the time to check it out. For those of you who don’t yet know the story, James Cameron’s environmental themed fable follows Jake, a marine who takes the place of his late brother in a mining project on the moon of a distant planet. The mission involves winning over the indigenous inhabitants by giving select people “Avatars”, or genetically engineered natives that are controlled telepathically while the humans are asleep. But when Jake Sully (Sam Worthington), meets the locals, known as the Na’Vi, falls in love with a Na’Vi woman named Neytiri (Zoe Saldana), and discovers the beautiful connection between the local plants and animals, he turns against the humans when he realizes that not only will the mining destroy the environment, but the Na’Vi as well. This story, while told through science fiction, rings true today, as many mining projects on Earth really do destroy the environment and displace native people. 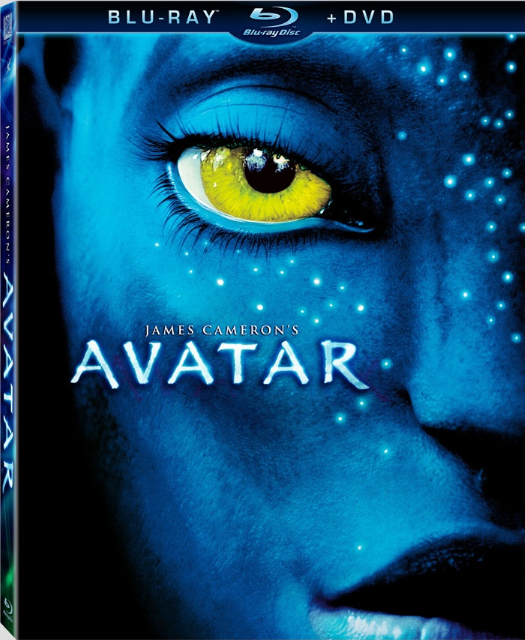 Avatar is a spectacular epic with a good message, and would be worth adding to your collection. For those who are wondering whether or not James Cameron’s spectacular film, Avatar translates well from the big screen 3D experience to at home viewing on Blu-ray or DVD the answer is a resounding yes. If you are already sold on the storyline of humans greedily destroying the beautiful fantasy planet, Pandora than the question of whether or not to own Avatar on Blu-ray or DVD comes down to how does it look visually at home. I found Avatar to be absolutely stunning in theatres. I found it to be almost as stunning at home: the intense blue palettes of the Na’Vi nd the luminescence of the many Pandoran creatures and nature are still breathtaking. The sense of depth, particularly in the flying scenes, is still there. Obviously the 3D experience intensifies everything but Avatar is still very watchable without it. While Avatar isn’t a perfect film (couldn’t anyone have thought of a better word than ‘Unobtainium?’) it has an interesting fantasy storyline, lots of action, and really beautiful visuals. Avatar fans will want their own copy right away. Those who haven’t seen the film may want to rent it first and then decide if they want to revisit Pandora again and again. I actually more out of this film on second viewing. Even without extras on the Blu-ray/DVD combo it’s worth owning. By now there is not a lot to add to all the commentary about the highest grossing film to date. Even those who found the script uninspired and the colonization theme an unfortunate throwback to old westerns have had grudging admiration for the beautiful alien world created by the film makers. The question is whether the film still holds up on the home screen. There is no simple answer. I only saw clips of the film in IMAX, and the whole film in regular 3D. Watching the Blu-Ray disk at home on a 32”1080P screen I found the images still spectacular even without the huge screen and 3D, and having enjoyed the film anyway, I liked noticing things missed the first time around, reassuring us that the plot did hold together as well as could be expected within its limitations. Obviously, if you didn’t like Avatar in theatres, it won’t work for you at home, but for those who couldn’t make it to a theatre the DVD or Blu-Ray is a good alternative, especially on a good hi-def monitor. You may want to hold out for subsequent releases however, promising extra footage and the extra features missing on this bare-bones single disk, or for those who can afford it the 3D version.